While hunting is our main activity, Spear Safari’s will certainly assist you in seeing more of our country and experiencing what it has to offer. Below are some of the activities which we can offer, however, if there is anything else you wish to do and see, please do not hesitate to discuss with us. 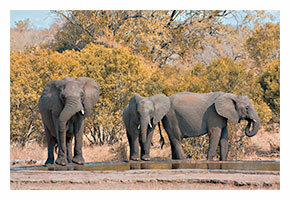 We can arrange pre or post safari activities in Zimbabwe. We recommend that our clients stay at Ultimate Guest Lodge in the town of Victoria Falls, where owner Russell Caldecott will take good care of your traveling and accommodation needs. This is a very hunter friendly Guest House and they will make arrangements for excursions in the area including a visit to the Vic Falls, Chobe National Park, Tiger fishing on the Zambesi River, white water rafting, absailing, etc. 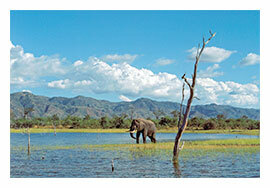 We can organize guided day trips to the world famous Kruger National Park. This incredible wildlife reserve is rated as one of the top fourteen of its kind in the world and is approximately 5 Million acres in extent. The aim of the Park is threefold – conservation of the wildlife heritage, protecting the interests of the local rural inhabitants and the development of unobtrusive amenities for visitors. Our base camp, Marula Camp, is approximately 30 minutes drive from one of the entrance gates to the Park – Orpen Gate. The Drakensberg mountains in the Limpopo Province are very majestic and breath-takingly beautiful. We will take you on a full day guided tour into this region and you will experience the wonders of God Window, Bourkes luck, Mack-Mack falls, etc. Along the way you will visit the old mining town of Pilgrims Rest and do some shopping at the town of Graskop. View the magnificent lowveld at the foot hills of the Drakensberg Mountains form a hot air balloon. This is a game rich area and you will spot various antelope and bird species from the air. Visit the Hoedspruit Endangered Species Research Centre and learn how the Roode family have contributed to the survival of the Cheetah (including in the King Cheetah) and other species such as the Sable antelope, Ground Hornbill, African Wildog, etc. Visit the Moholoholo Rehabilitation Centre for Wild Animals and experience being in an enclosure with vultures and other bird species. 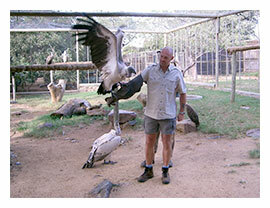 This Center is focussed on rehabilitating and re-introducing animal and bird species to the wild. Those that can not be re-introduced are kept at Moholoholo for educational purposes.